Drinking lemon water for losing weight isn't very popular, in fact some people believe that lemon water consumption will cause Gastritis because it is acidic. But did you know that although water and lemons by nature are acidic, but when you combine and consume them they are actually very alkalizing to our body? Plus, the more alkaline our body are, the healthier we feel and look! So lemon water helps in weight loss, is it a myth or fact? It is a FACT. How? As we all know, lemons are rich in vitamin C and is also called asorbic acid. Our liver is a key organ in weight control, therefore lemon water thins acid and clears bile from the liver. Vitamin C triggers the glutathione production, which is an antioxidant that is needed for liver detoxification. Hence, removing bile and liver cleansing helps metabolize fat more efficiently. "lemon's acidity helps break down food in the system and decreases hunger." says author of the diet, Theresa Cheung. According to studies, lemon juice helps in digestion and suppressing appetite, supported by a study in the Journal of the American College of Nutrition. Also, according to FITDAY, lemon also contains pectin fiber which is the cause of hunger decreased. The more we do our businesses in the bathroom, the better it is for our body as more toxins are leaving our body. How and When to consume lemon water? Based on the book "The Fat-Fighter Diet" by Bruce Krahn, it is recommended to consume lemon water in the morning, or the moment you wake up, in an empty stomach. Drinking warm or slightly hot lemon water is an additional benefit for weight loss. Other than morning, lemon water can be consumed any time of the day. For instance, instead of drinking sweet drinks, drink lemon water. 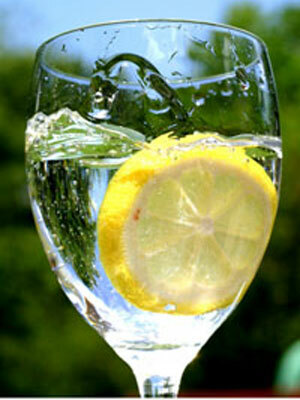 Or if you do not feel like drinking water because of the dull taste, add some lemon juice. However, please do not starve yourself and drink lemon water only for weight loss purpose. Remember that eating smaller meals regularly helps in fat burn as our metabolism is running. Keep in mind that starving will slow your metabolic rate hence causes your body to store fats. Do know that Lemon water/juice has the properties that helps with weight loss, however it is not the main cause of weight loss on its own. A proper and healthy way for weight loss is to eat healthily, accompanied by regular physical activities and enough sleep. Lemon water has many advantages for health other than weight loss. Please visit think link to see more. Hahahha so funny la you... It's not a myth... it helps with digestion and clear off toxins. For weight loss, best drink it warm or hot instead of cold. :) And also like I mentioned above, you can not rely on lemon water alone for weight lost. From what I read, when lemon juice is mixed with water it becomes alkaline.